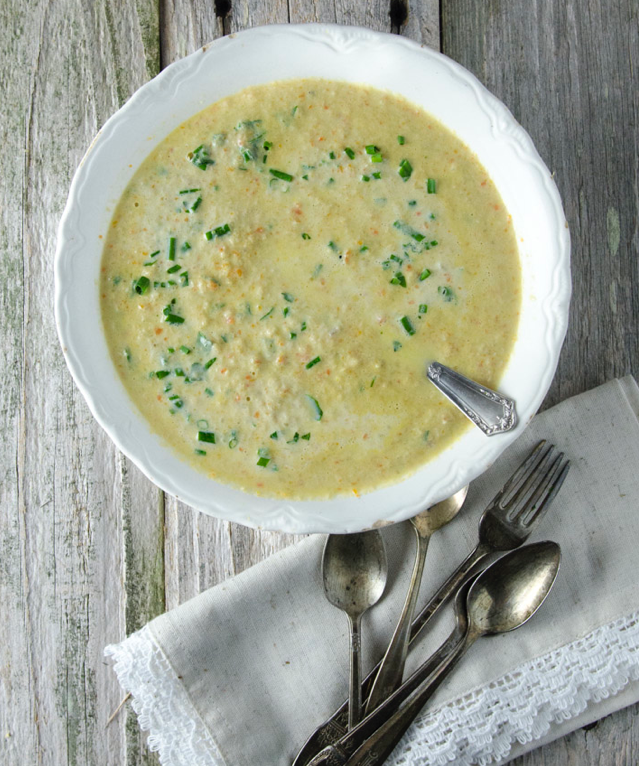 Homemade Cream of Chicken Soup is nothing like the pale, gloopy, gravy-like mess that comes out of a can; rather, it’s an utterly delightful, soothing and rich-flavored soup dotted with fresh vegetables and herbs and very finely minced chicken. While we can think of bone broths and stocks as stand-alone dishes and ingredients we make, either to enjoy them on their own or to add them to other dishes, but there’s a whole assortment of traditional dishes in which meats, bones and vegetables are simmered together to make their own broth. These dishes tend to be humble foods, simple and lovely. They’re easy to make, too. Among my favorites I’ve included in Broth and Stock are Oxtail Stew or my nana’s long-simmered Pinto Beans with Ham Hock. Homemade Cream of Chicken Soup, dotted with aromatic vegetables and fresh herbs, is one of those recipes. It calls for a whole stewing hen, with meat, skin and bone, which allows you to reap the benefits of broth, and couples them with other nutrient-dense additions like egg yolks which thicken the soup, a more traditional method than the use of flour. Growing up, all I knew of creamed soups is that they came from a red- and-white tin that, when opened, would yield a bouncy gelatinous goop that served as the glue that bound the casseroles we would take to church events. This soup is not one of those; rather, it’s a lovely, comforting blend of aromatic vegetables, butter, egg yolks, cream, fresh herbs and chicken. This soup makes little waste and, in a home where every penny counts, it’s rather nice to eke out every bit of flavor and nourishment from what you have available to you. So, use up the celery leaves and the carrot tops and you’ll find they give the soup a beautiful aromatic flavor that blends well with the soft and soothing flavor of chicken, cream, parsley and chives. 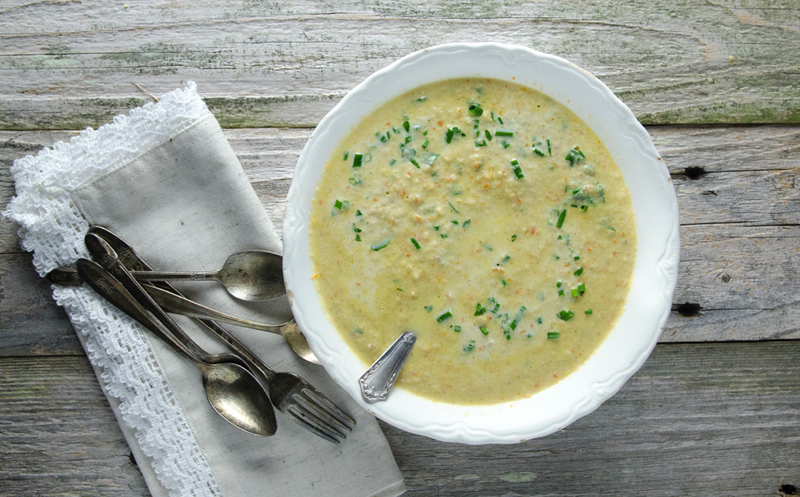 This homemade cream of chicken soup is gentle and soothing in its flavor, deeply comforting and satisfying. It doesn't freeze well, so plan to use it up within a few days of making it. You can find this recipe, and many others, in Broth and Stock (Ten Speed Press) available through Amazon, Barnes and Noble and your local book seller. Pluck the leaves from the celery and place them in a stockpot. Chop off the carrot tops and peel the carrots, dropping both the peelings and tops into the pot. Chop off the root and top ends of the onion and peel it, tucking onion trimmings into the pot. Mince the celery, carrots and onions very finely, and then place them in a mixing bowl. Rinse the chicken thoroughly and pit it dry before adding it to the stockpot, covering it completely with water by about two inches. Pierce the leeks with the cloves so that they remain stuck inside the tender stalks and place them in the stockpot alongside the stewing chicken. Slowly simmer until the chicken is completely cooked and tender to the bone, about two hours. Carefully remove the chicken from the pot and place it on a platter to allow it to cool until you can pick the meat off the bones comfortably. Strain the remaining broth through a fine-mesh sieve into a pitcher or jar, discarding the solids. Wipe the pot clean with a kitchen towel. Melt the butter in a cast iron skillet until it foams, toss in the minced vegetables and fry until they become fragrant and tender, about 5 minutes. Transfer to the cleaned stockpot. Once the chicken has cooled, pick its meat off the bones. Mince the meat very finely . Stir the chicken into the vegetables and pour the strained broth back into the stock pot. Stir in the finely grated nutmeg, and then bring it all to a bare simmer over medium heat. Temper the beaten eggs by stirring a spoonful of broth into them, and then pouring the mixture of eggs and broth into the simmering soup. Gently stir in the heavy cream, parsley and chives. Season with salt and pepper. Ladle into soup bowls and serve warm. Just made up this soup to freeze in portions for recipes. Excited to bring back some favorite easy meals that have been long forgotten since we’ve been eating with nourishment over convenience foods in mind! Being that this isn’t condensed…any idea what size portions I should consider dividing it into, to use in place of the icky cans? BTW this also thrills me as a way to put some scrawny stewing hens to good use. Win all the way around! Thank you! Did this recipe freeze well? I’m wondering the same thing. Does this soup freeze well? Thanks so much for this recipe! It definitely gets the thumbs up from my family! Hubby and 2-year-old both love it (as do I). However, just wondering if it would be even better to use pre-made, long-simmered chicken stock, in order to benefit from the minerals etc extracted from the bones. Any tips on doing this? How many chicken fillets and how much stock might I need? Any ideas on how to incorporate the leek and clove tastes if the bone broth was not made with these ingredients? This soup is awesome! We all loved it at our house. One question, though – mine didn’t thicken at all and your pic looks like it might have some thickness? Is that just an illusion, or did I mess something up? 🙂 Thanks for this recipe! The blog belongs to a lovely Mennonite wife and mother who makes many things herself. Bonny, I am sure your recipe is good, but it isn’t paleo. It calls for flour as a thickener. My farmer offers a ‘soup chicken’ which I guess is older and less tender then the roasting chicken. Do you think I could substitute that or should I stay with the regular chicken? I just made this today because I was searching for a way to use some extra egg yokes and I jus so happened to have a chicken in the fridge that I planned on roasting. I follow a paleo way of eating so I subbed the heavy cream for coconut milk and it was fantastic. I had some for dinner and froze the rest in half cup sizes. I am definitely making this again and again. I’m also going to try the basic format and do a cream of mushroom. love it thanks! Thanks! This is the first one I’ve seen that doesn’t require flour, which I avoid. Anyone know how to make a cream of mushroom or celery like this? This is the best chicken soup that I have ever tasted! I was searching for a soup recipe that would allow me to make use of a small cheap roast chicken carcass that only had half of the breast meat left on and couldn’t find anything that didn’t need more chicken than that. I really liked the sound of this one so I came back to it and thought I’d take a chance on it. So glad I did! Even with a minimal amount of chicken it was absolutely gorgeous. I decided to blend in the leek with the chicken and other veg; minus the cloves of course. I also garnished with coriander leaves (cilantro), because I’m not a huge fan of parsley. I will be making this a lot. Just beautiful! My mother learned to cook with Meta Givens! She passed the book on to me and I used it until it broke! Fortunately, I found a two-volume version in a used book store and still refer to it for good basic recipes. The pureed vegetables and chicken didn’t seem to want to mix well into the broth at step 9, and upon looking at it today after a night in the fridge, much of it has separated (puree from broth). Did anyone else have that? Did I miss a step or an intuition somewhere? Thanks! Your recipe says 2-3 cloves. Is that really cloves? Or is it supposed to read “cloves of garlic”? Thanks! I just pre-ordered your new book Broth and Stock and can’t wait for it to arrive. Thank you so much for the Cream of Chicken soup recipe. I’m definitely going to be making it soon. I imagine it would freeze well if frozen before adding the eggs and cream. Think I’m going to try this and freeze half before adding all the ingredients to see how it works for more manageable serving sizes. I love the ancient wisdom of using all the parts of animals and fish. Good for you, good for the environment and best of all, downright delicious! I would like to try this without the chicken, any idea the ratio of liquid to egg yolks? I recommend making this with chicken. This isn’t a dairy-free blog. How would you make this in an Instant Pot?